This time of year is probably the worse for wild life and your pets. Whilst we all enjoy the bonfires and the fireworks, they are cowering away from the loud bangs and their homes are being burnt. 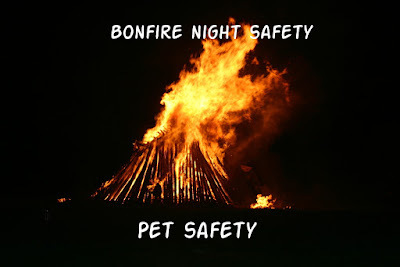 Many animals are hurt every year on bonfire night. So here are some tips to make sure your bonfire nights are as safe as possible for all those little creatures! If you have animals that are out in fields for example, horses and sheep, ensure they are in familiar environments. If possible shut they in from the outside world for the night ensuring they have no where they can hurt themselves! If you have cats and dogs keep them inside. This will reduce the risk of them getting spooked and running off. It also keeps them safe from any fires they may have been lit. Try and stay at home with your dogs and cats so they are not alone when they are scared. If you walk your dogs late in the evening try and make sure you walk them before it gets dark, this reduces the risk of them walking near by lots of fire works going off. Should your pets display fearful behaviour ignore it. By reinforcing negative behaviour it will encourage them to do it more often. Keep your dog distracted by giving them a toy to play with or a treat to chew on. If you have small animals such as Guniea pigs, rabbits ect, Ensure their cages are partly covered with blankets, this allows them to have somewhere quiet to hide. Give your pets extra bedding to give them something to burrow into and feel safe. The best way to enjoy fireworks are at big organised events as they are not only safer for animals but for you as well. I would like to just wish everyone a good time with whatever you may do.